Enjoy the extensive product listing in over 10 categories that include Digital Cables, Interconnect Cables, Phono Cables, Power Cables, Speaker Cables, Video Cable: HDMI, Video Cable: Other, Subwoofer Cables, Headphone Cables, and Deal of the Week. Looking for a specific brand? 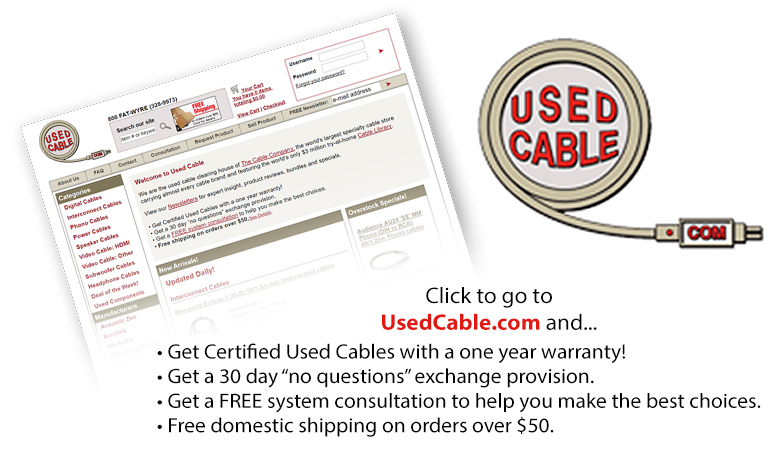 You'll find UsedCable.com offers a vast selection from the likes of Acoustic Zen, Acrolink, Alo Audio, Alpha Core Goertz, Analysis Plus, Audience, Audio One, Audioquest, Aural Symphonics, Cable Research Lab, Cardas, Chord Company, Creative Cable Concepts, Crystal Cable, DH Labs, Dynamic Design, Dynamique, ESP, Furutech Gutwire, Harmonic Technology, Harmonix, Jena Labs, JPS Labs, Kimber, LINN, Mark Grant Cables, MIT, Monster, Monster Cable, Morrow Audio, NBS, Nirvana, Nordost, Omega Mikro, Outlaw Audio, PS Audio, Purist Audio Design, Shunyata Research, Siltech, Sonic Horizons, Stealth Audio, Stereolab, Straightwire, Synergistic Research, Tara Labs, Tech Link, Transparent, Tributaries, UVan den Hul, VooDoo Audio, Wasatch, Wireworld, and XLO.